In Electronic Warfare (EW), disrupting communications is a daunting task because of the plethora of frequencies exploited by the enemy. Antenna Experts antenna systems provides innovative high-power, broad band antennas that allow armed forces and intelligence agencies to adapt to ever-increasing threats and changing requirements. Compact, versatile, rugged, and field-proven antenna technology is excellent for electronic warfare applications. Our antennas provide superior ultra wideband performance with highest efficiency. The broad band capability of our antenna systems allows extreme wide bandwidths and design to handle 1KW of power. Therefore few antennas are required to meet existing and new threats instead of installing multiple antenna systems. Antennas manufactured by us are inherently well matched, typically with VSWR less than 1:2.5. No Antenna Tuning Units (ATU) are required to operate our antennas. Antenna Experts provides solutions for Communication, Navigation and Identification (CNI) antennas searching, detecting and jamming all communications signals. Survival in the digital battlefield is only possible through the use of flexible technology. We provide the fastest and smartest solution to intercept the multitude of signals and information to be successful in the age of information warfare. Antenna Experts manufactures EW Antenna for directional coverage like HF log periodic antenna, VHF log periodic antenna, UHF log periodic antenna, dual polarized log periodic antenna, cross polarized log periodic antenna. 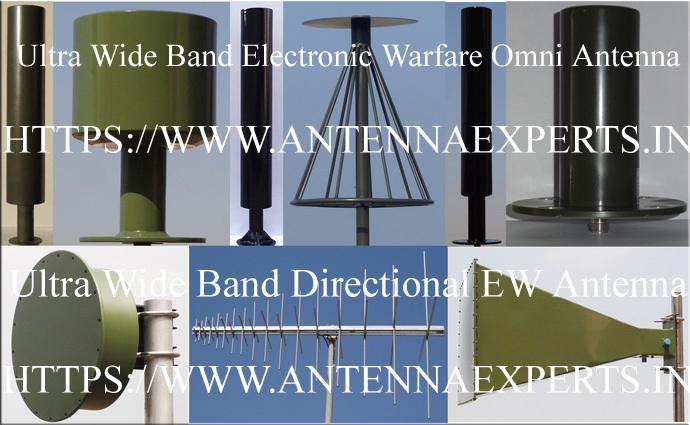 Antenna Experts also manufactures electronic warfare antenna for Omni-directional coverage like HF broadband conical vertical monopole antenna, wide band discone antenna, ultra wide band discone antenna for HF/VHF/UHF bands 2MHz to 6000MHz. JC & JD Series High Gain RCIED Jammer Antenna for Omni-directional Coverage for Vertical Polarized Waves. Please visit our "Log Periodic Antenna"; “Dual Polarized Log Periodic Antenna”; “Wide Band Discone Antenna”; “RCIED Jammer Antenna” and “HF Broadband Conical Monopole Antenna” sections for more details of their respective antenna products datasheets and installation manuals.